A Slice of Smith Life: Making You Laugh with "Stories for the Homeschool Heart"
Making You Laugh with "Stories for the Homeschool Heart"
I have mentioned the book, Stories for the Homeschool Heart, a few times on my blog already like on this post here. I recently received my copies in the mail and have enjoyed reading the beautiful stories so far! I would like to share with you a part of an entry of one of the stories in this book. Please note that this is copyrighted information that can't be shared without the publisher's and author's permission, which I have received. Theresa Thomas, one of the authors/editors and contributors to this book, wrote Husband's Comments to their Homeschooling Wives (page 161). I enjoyed her humorous one-liners so much that I wanted to share a few of my favorites. (Although it was hard to narrow down my favorites because they all bring a smile to my face). So thank you Theresa for this privilege to make someone laugh today! Might be tempted to say: "Gee, the house is a mess." Better choice: "Wow, DNA. Can I help you put the Lego molecules back in the box and pick up?" Best choice of all: (Turning to wife) "You think of the best projects for these kids and I'm sure you could use some cleaning help. Let's get a weekly cleaning service so you can concentrate on the kids' education!" Might be tempted to say: "32 books!? How can you have fines on 32 books? Who even reads 32 books?" Better choice: "Well at least the kids are learning something." Best choice of all: "You actually saved us money! Do you know how much it would cost to BUY 32 books!? I'm so glad the kids are reading so much. You're a great teacher. Let's go out for dinner!" There are so many other great lines that Theresa has included in this entry. I hope you will want to read more! I highly recommend Stories for the Homeschool Heart not only because it will make you laugh , but you will also be inspired and touched in a special way with each story. Each contributor eloquently writes from their heart and soul about all the triumphs and trials of parenthood while living with a homeschool heart. You can find out more information about this book and the authors and contributors here. Stories for the Homeschool Heart would make a great gift for a loved one or friend! You can purchase it at Bezalel Books and it can be found on Amazon too! Thank you again to Cheryl, the publisher, and Theresa, one of the authors/editors, for allowing me to share a part of the many great stories in Stories for the Homeschool Heart! "My 'little way' is the way of spiritual childhood, the way of trust and absolute self-surrender." 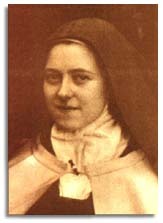 Today is the feast day of St. Therese of Lisieux. She is one of my favorite saints and her short life and story touched me in a special way during my pilgrimage to Medjugorje last year in Nov. 2009. I am grateful that St. Therese, also known as the "Little Flower", is a beautiful role model of how to love and sacrifice during our earthly lives. That sounds like a great book, Tracy. Thank you for sharing some of it. I clicked a vote for you at PF and MB. I hope you and your family have a wonderful day. Happy Feast of the Little Flower! She has sent a rose or two my way when I've needed one... my children are making the effort today to practice her "Little Way." Hello! Stopping by from Boost My Blog Friday to follow your blog :-) Looking forward to reading more! This is a great book! I hope you like it enough to get it! Every story is so inspiring! I hope you and your children enjoy practicing living the "Little Way." I'm a new follower from Following Friday. Your blog is too cute. I love the husband comments to homeschool moms. I'm thinking about homeschooling, and if I do, I'll be happy to share these comments with my husband as he could learn a thing or two about "helpful" vs. "unhelpful" comments. Getting a cleaning service--well, that would be the most incredible suggestion/comment/gift of all :) I love your harvest moon pictures...just gorgeous! Thanks for stopping by and leaving a comment :) I visited your blog and left a comment on your latest post! Hi Bonni at "Let's Make a Difference"
Thanks for your visit,comment and follow! I just left a comment on your most recent post :) I am now following your blog via Google Friend Connect and I clicked a vote for you too on Top Mommy Blogs! Thanks for your visit, comments, and follow! I just left a comment on your blog and I'm your newest GFC follower. I'm glad you enjoyed the husband comments. This is a great entry Theresa did in the book. I love it and wanted to share it with others! I'm thankful for the permission. Great to see your visit and comment on my blog! Thanks for stopping by and following! I left a comment on your photo contest post and voted for your daughter's picture. Your daughter is adorable in her beautiful dress! Thank you for your visit and comment and I'm so glad you are interested in getting this book. You won't be disappointed when you read all the wonderful stories! I just left some comments on your great blog. Your family and blog are beautiful! Happy Homeschooling and have a good weekend! Love the library book comment. If only my husband could be so enlightened!